For information on South Central Sleep Center, please call 601-426-2886. South Central’s Sleep Center is located on the Third Floor of SCRMC. Clinical hours: 7 p.m. – 6 a.m.
South Central Sleep Center is fully accredited by the American Academy of Sleep Medicine.Our mission is to provide excellent care in the diagnosis and treatment of sleep related medical disorders. The Sleep Center staff provides evaluation, diagnosis and treatment. Patients may be self referred or be referred by their physician for a sleep evaluation. The first step is a sleep evaluation by Dr. John Wallace at Jefferson Medical Associates in Laurel. During the evaluation, your medical history and sleep problems will be evaluated. If possible, your spouse should attend with you, as he/she can be valuable in describing sleep events that you are not aware of. This sleep evaluation will help define your sleep problem as well as explain diagnostic and treatment options. Sleep apnea is the most common sleep disorder and diagnosis and treatment requires an overnight sleep study (polysomnogram). This evaluation is done at the Sleep Center at SCRMC and follows AASM guidelines. The patient will spend the night in one of our quiet and relaxing bedrooms and will sleep on a comfortable double bed (not a hospital bed). The room is equipped with cable television, a comfortable recliner, and has an adjacent bathroom. The patient will come to the Sleep Center at 8 p.m. the night of their study prepared to spend the night and the study will conclude 5 a.m. the next morning. The patient’s sleep is monitored by a sleep tech from a central room across the hall. The patient should not have to miss work to have the evaluation unless they work the night shift. Most insurance companies and Medicare will pay for the exam and for any equipment needed to assist with your condition (CPAP machine). We are in the network with all major insurance carriers in the area. 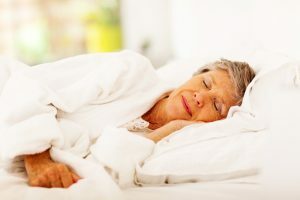 Your sleep study will be analyzed and you will be contacted by the Sleep Center Coordinator to explain the results of the study and any follow-up plans. South Central Sleep Center operates a Durable Medical Equipment (DME) division for dispensing and servicing of CPAP and BiPAP machines, as well as equipment for sleep disorders. The South Central DME Sleep Center is accredited by the Accreditation Commission for Health Care. This facility allows for better contintutiy of patient care to our patients. 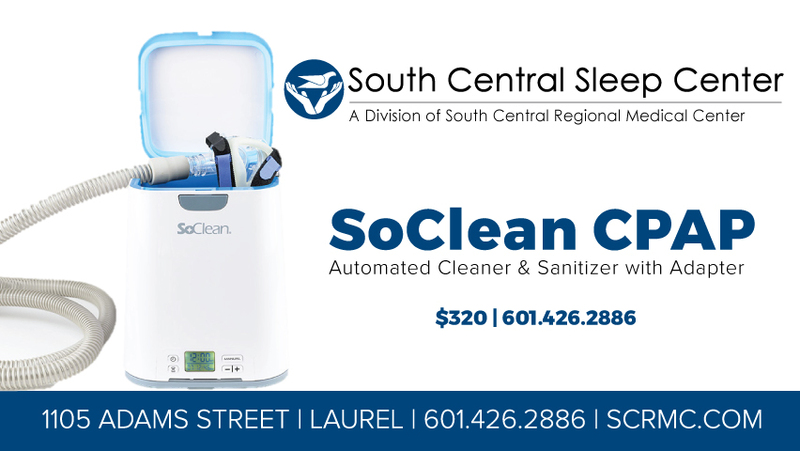 The facility is located at 1105 Adams Street in Laurel, MS.
South Central Sleep Center now offers the SoClean, an automated CPAP equipment cleaner and sanitizer. By using the SoClean 2 CPAP cleaning machine, you can sanitize and disinfect your CPAP mask, hose and reservoir without needing to take pieces apart daily. The machine does not require water or chemicals in order to avoid condensation and ensure your equipment remains completely dry. The SoClean CPAP cleaner and sanitizing machine uses activated oxygen cleaning to eliminate any germs and bacteria that may be lingering in your home CPAP machine. The product is available at the South Central Sleep Center at 1105 Adams Street for $320. The kit includes SoClean unit and mask adapter. Pre-clean solution and filter kits are available, also. South Central Sleep Center is fully accredited by the American Academy of Sleep Medicine. South Central Sleep Center operates a Durable Medical Equipment (DME) division for dispensing and servicing of CPAP and BiPAP machines, as well as equipment for sleep disorders. The South Central DME Sleep Center is accredited by the Accreditation Commission for Health Care. This facility allows for better continuity of patient care to our patients.